This hearty Black bean and Callaloo soup is stylized with the Caribbean flair saluting the island of Puerto Rico. 1. In a large dutch oven, heat 1 tbsp of olive oil and 1 tbsp of coconut oil. Cook the diced pork belly (pancetta or bacon) until golden brown (mix often). 2. Add the onions and when they begin to turn a bit translucent, add the diced garlic and the optional Scotch Bonnet Pepper (seeds removed). 4. add the carrots and celery. Let simmer for 5 minutes. 5. Once the carrots and celery have been cooking for about 5 minutes, add the cubed Caribbean yams. Let cook for an additional 5 minutes or so. 6. Once the yam has been cooking for about 5 minutes add once cup of water and let come to a simmer. 7. 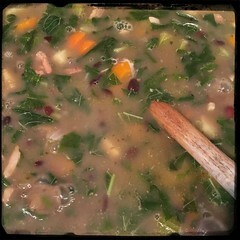 Add one cup of stock at a time, alternating with the water, allowing the soup to come to a simmer before adding another. 10. add the callaloo, cover pot and let cook for 10-20 minutes (stirring frequently).